Meet GLIDE's Interim Senior Pastor, Bishop Warner H. Brown, Jr.
With the recent departure of GLIDE’s Senior-Pastor–turned-Bishop, Karen Oliveto, GLIDE has been deeply fortunate to welcome back to its congregational leadership, on an interim basis, Bishop Warner H. Brown, Jr.—although as the Bishop makes clear below, his many roles in and around GLIDE over the last nearly 40 years make it seem as if he were never really gone. 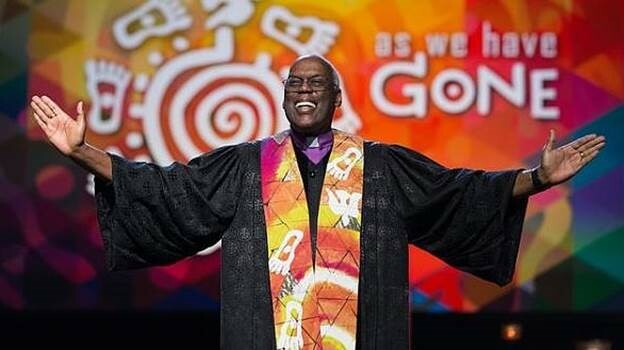 Bishop Brown will be in place as GLIDE’s Interim Senior Pastor until the United Methodist Church concludes its search for Bishop Oliveto’s replacement, which will happen probably sometime before and no later than July 1, 2017. We recently sat down for a chat with Bishop Brown in his second-floor office here at GLIDE, on the occasion of his return and in hopes of (re)introducing him to the larger GLIDE community. When were you first called to work with GLIDE? I thought to myself, if I ever have the opportunity to become a pastor in California, I’m gonna jump on it! And a few years later that [opportunity] came. I was hired in a national search by our annual conference office [of the United Methodist Church]. I started working here in 1979. I worked out of GLIDE for eight years in different roles. I started out as a staff person, then became a sort of “chief of staff” the following year, and then I became the District Superintendent—the person who supervises the churches in San Francisco, including GLIDE. In all of those jobs my office was always here at GLIDE. During that time, I became a GLIDE board member, too. What is it like to be back at GLIDE again? Has anything changed? Obviously a lot has happened over the last 40-some years, and GLIDE has changed in a lot of ways. But some core values are still in place and are still very important: Our commitment to liberation; to helping people, at whatever point they are at in their life, to discover they have some ways to shake off what’s holding them back and to engage life more fully; and to being a part of the change we want to see. Being close to GLIDE off-and-on over that 40 years means it doesn’t feel like I left. I finished my time as a board member and then became a staff person for a while, so I was still close to it all. But one of the things that is good to see is that we have continued to improve as an organization in many ways. The size of the staff, the depth with which we’re able to help people, has continued to grow and maintain its quality. When we reach out to help somebody, we don’t go away. People know that they can count on us. What is your favorite song in the GLIDE Ensemble’s repertoire? One that I like is, “I Know I’ve Been Changed.” One of the maturing realities of life is discovering what your vulnerabilities are, realizing you can change, and finding the power to make that change. The spiritual power is what makes that possible for all of us. And that song for me connects with that. One of the pleasant discoveries in coming to GLIDE was with people that had hit the bottom in life and were finding opportunities to change. It’s impressive. But the real awakening was to discover that the liberation being offered here is for me too. It’s for all kinds of people. Editorial Note: We reprint the following excerpts of a biographical overview with the kind permission of Bishop Brown and the GLIDE Church staff. Bishop Warner H. Brown Jr. was born and raised an only child in Baltimore, Maryland, the son of Ida and Warner Brown. At the age of 13, while reading the New Testament, he felt a call to serve. He began preaching as a youth, and was encouraged to continue doing so. As a young adult, he attended the University of Maryland (B.A. in Sociology, 1969.) He also graduated from Wesley Theological Seminary in Washington, DC with a Master of Divinity degree. Throughout [his distinguished career], Warner has been active in the social justice ministries and programs of those communities and church connections where he has been appointed. To list but a sampling: Volunteer Police Chaplain, Trustee of the Glide Foundation, vice-chair of the Community Advisory Commission for Alameda County Medical Center, member of the Governing Board of United Way for Kern County, a member of the Board of Directors for the Bakersfield Homeless Shelter, recipient of the 1996 Outstanding Leadership and Service Award for Emergency Response Ministries, given by UMCOR, and recipient of a 1998 Special Congressional Recognition from Congresswoman Barbara Lee. Warner’s leadership in the church has included service as delegate to the General Conference, member of the General Commission on Religion and Race, a faculty member for New DS/CCD training, Harry Hoosier Member of and twice the host for the National Black Methodists for Church Renewal, chair of the Board of Missions in the California-Nevada Annual Conference as well as numerous other conference boards and agencies, adjunct consultant to the Alban Institute, and a Wesley Seminary Distinguished Alumni. Bishop Brown is married to Minnie Jones Brown. Their family includes Catina Marie Harvin, Warner III, and Calvin Brown.